Q: In the last problem, I would have liked to see how the N was isolated. I did not follow the math on the reciprocal to isolate N.
Cathy's Salary is 3/7 of Nora's salary and (Cathy's salary) is also 5/4 of Teresa's salary. Now, I isolate N by multiplying both sides of the equation by (7/3), the reciprocal of 3/7. (7/3)(3/7) = 1 so (7/3)(3/7)N just equals N.
Q: The lesson doesn't really explain why we multiply by the reciprocal to get the answer in the second problem. I am very confused. A: Happy to help! This is just an extension of one of the rules of working with algebraic expressions: when trying to isolate a variable, you can perform a number of operations to both sides of an equation, but they have to be done to both sides. In order to isolate x, I multiplied y by the reciprocal of the fraction on the left side. That's just the easier, faster way to do it. It's shorthand for the same process. In this video, we're going to talk about word problems with fractions. The very first rule that we'll talk about is as a general rule when translating words to math, the word is means equals and the word of means multiply. This is a very important guide and this will help us translate many word problems involving fractions into math that we can do. For example, very simple question. This is a little simpler then you'd see on the test. What is three fifths of 400? So this might actually be something that would be part of a larger problem on the test, but we'll just treat it as its own thing right now. Three fifths of 400. The of means multiply, so this just mean three fifths times 400. We write 400 as a fraction, we notice that we can cancel. Once we've canceled them we can multiply and then we get the answer. Another question this is starting to get a little more test like. 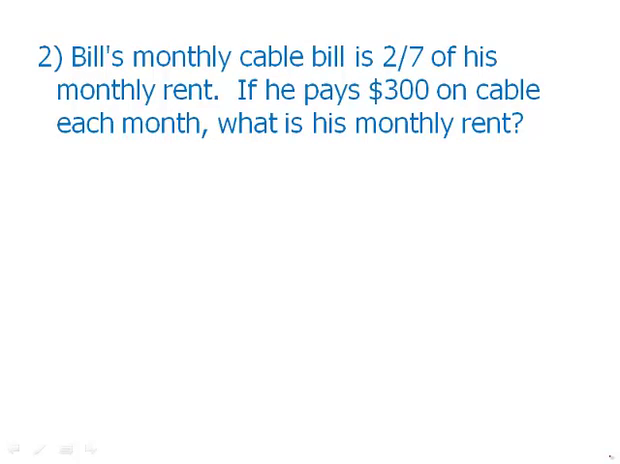 Bills monthly cable bill is two sevenths of his monthly rent if he pays $300 on cable each month what is his monthly rent? So this is interesting. The first thing I'll do is I'll introduce some letters to stand for these things. C equals cable, R equals rent. Now that first sentence, Cable is two-sevenths of rent, that means cable equals two-sevenths times R. Now once I have this equation, I'll just substitute the value I have. The cable is actually $300. Now, we want to get the R by itself, so I have to multiply by the reciprocal of that fraction. The reciprocal of two-sevenths would be seven-halves. So I multiply both sides by seven-halves. Cancel, and then I just complete the multiplication. For this one, now this one is starting to get to be like something that actually might be on the test. Cathy's salary is 3/7 of Nora's salary. And is five-fourths of Teresa's salary. Nora's salary is what fraction of Teresa's salary? So, this is a very confusing question. So, first thing I'm gonna say is, we'll represent each one of the salaries by the first letter of the female's name. So C is three-sevenths of N. Also, C is five-fourths of T. So we can translate that first sentence like this. Now notice that the question is asking us to relate Nora and Teresa's salary. So really, C is irrelevant. Really that part of the equation drops out. And we just want to compare Teresa and Nora. And we want Nora's salary is what fraction of. So we want Nora by herself, and we want a fraction times Teresa. So to get Nora by herself, we have to multiply by the reciprocal of three sevenths that would be multiplying by seven thirds. That would get N by itself. We just multiply and we get the fraction of thirty five over twelve. In most word problems, of means multiply and is means equals.